You have seen my Poke 'N Pull and No Roll Seam Rippers. Now, check out my new Porcupine Quill Stiletto! 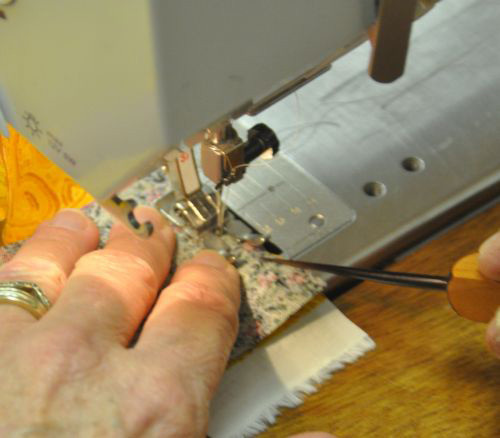 How many times have you wished that you had a sharp-pointed tool that you can use to manipulate your fabric while you are sewing? I now have a hand-made nifty pointed tool available that does just that. The Oak or Cherry wood handle is designed with ergonomic thumb flats on four sides so it is very comfortable for both right and left handed quilters plus it will not roll on your sewing surface. Since the business end is made from an actual African Porcupine Quill it is very sharp and flexible but not unbreakable so caution is advised. This will make a nifty tool that you will find indispensable in your sewing room. It is becoming one of Val's favorite tools.